Ever notice how some of the best sci-fi horror movies have the least imaginative titles? John Carpenter’s highly regarded movie “The Thing” certainly doesn’t buck this trend. If you hadn’t already guessed, the thing that appears in the titular film and game isn’t in any way pink, fluffy or cute, but rather a grotesque blob of parasitic alien killing machine that can posses you or your fellow team members. The game takes place after the events of the cult movie. 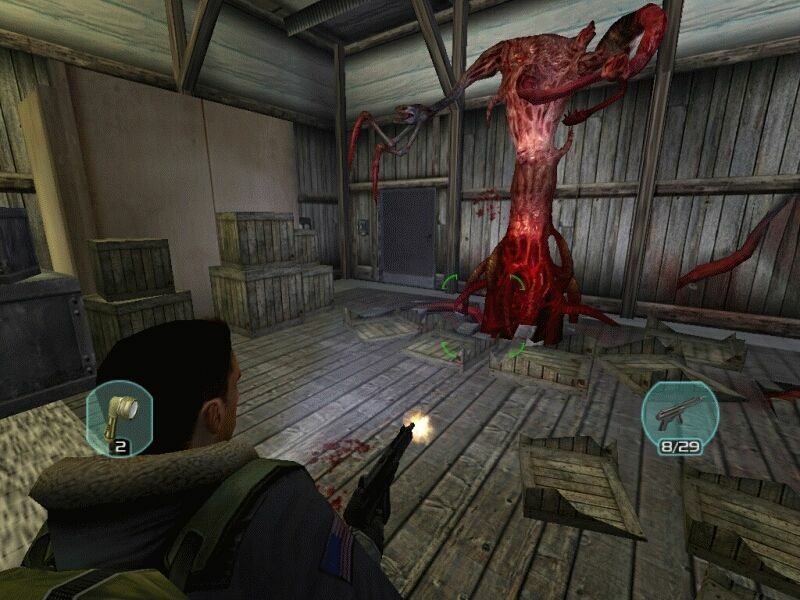 You will lead a team into what remains of the base to investigate what happened to the original crew. 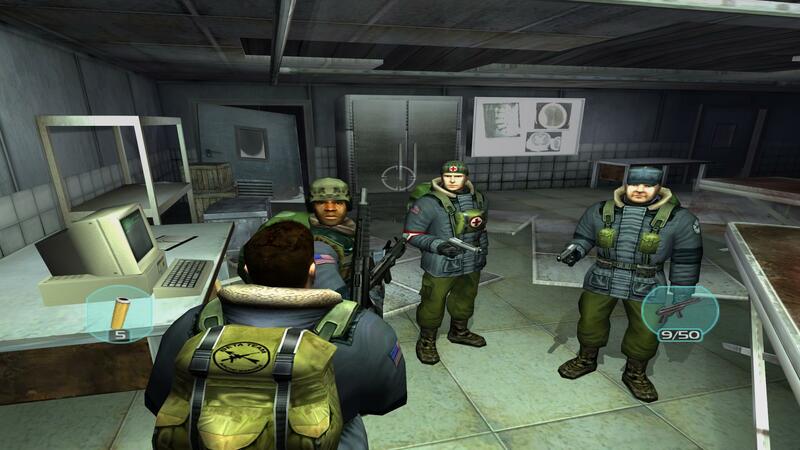 As well as dealing with the alien, you’ll also have to contend with fear and paranoia amongst your fellow soldiers. The game should install without any issues on a modern PC. Simply insert the DVD into your computers optical drive and follow the on-screen prompts. If the games installer does not start automatically, simply browse to the DVD in Computer/This PC and run the “Setup.exe” program manually. Before you start playing the game, we recommend installing the latest patch. Patch 1.2 adds a very handy mouse-look mode, which makes the game play more like a modern PC game. Patching the game can be a little confusing as you need the correct patch for your region of the game, so follow the instructions below carefully. For the US version of the game, you need two patches, patch 1.1 and patch 1.2. Patch 1.1 can be downloaded here, while patch 1.2 can be downloaded here. For European versions of the game (excluding the German version) you only require this patch, as the game is pre-patched to version 1.1 already. The patches will download as zip files. To install the patches, simply run the executable files from inside the zip folders once downloaded, then follow the on-screen prompts. If you accidentally try to apply the wrong patch, the patching programs will warn you, so pay attention to any error messages you see. In order to run The Thing on modern versions of Windows, all that is required is to set the game to run in compatibility mode for Windows XP (Service Pack 2). If you don’t change this setting, the games video cut-scenes and intro may not work and the game may crash back to the desktop. Simply find the shortcut to the game on your Start menu or Start screen and apply the compatibility mode. If you’re unfamiliar with configuring compatibility options, see this link. After changing this setting, Windows may unfortunately insist on running the game in Administrator mode each time. Unlike most PC games, The Thing has almost no user-configurable graphics settings. The only two settings that can be configured are “Resolution” and “Colour Depth”. To access these options, start the game and from the main menu, go to “Options” and then “Audio/Video”. Resolution should be set as high as your monitor will allow. If you installed the latest patch, the game should support widescreen screen modes just fine. Colour depth should always be set to 32 on a modern PC. Gamers who have Nvidia or AMD graphics cards can squeeze a little more visual quality from the game by using their graphics cards control panel to force antialiasing on for the game. Consult your graphics cards user manual for more details of how to do this. On our Nvidia based rig, we used the NVIDIA control panel and under “Manage 3D settings” we added The Thing as a custom program. We then set “Antialiasing – Mode” to “Override any application setting” and “Antialiasing – Setting” to “32x CSAA”. This significantly improved the visual quality of the edges of objects in the game. We strongly recommend using keyboard and mouse for the game. The game does not natively support joypads and there are a number of keyboard commands you will need to learn in order to manage your squad. Remember if you want to use mouse-look mode you need to enable it from the Options menu under “Advanced Controls”. The popular gaming utility XFire supports The Thing, allowing you to take videos and screenshots and chat to your friends while you play. Problems saving games and configurations – Like many old titles, The Thing saves its game data into the same folder as the game itself. In some instances on more modern versions of Windows, this will mean that save games and configuration files cannot be written. To solve this problem you can either run the game as administrator (right click on the games icon and choose “Run as administrator”) or, better still, set the permissions on your game folder so that your user account has full control/read write permissions. You can find a tutorial on how to configure folder permissions here. The games default installation directory is “C:\Program Files (x86)\Computer Artworks\The Thing\”. The actual save game files are stored in the “bin” sub directory and are named “slot1.sav”, “slot2.sav” etc. Remember the game doesn’t save your progress automatically, you must get to a tape recorder in order to save. Fighting the gruesome thing. This is how the game would have appeared on an older PC. Lining up with your squad. Playing the game on a modern PC in 1080p with antialiasing. Installed the game without issue and ran the two update patches. When I start the game the first screen showing the developers loads and then it goes to a black screen. This is probably where the menu would be but it never loads. I have tried different compatibility mode settings, running as administrator and anything else that came to mind. I am running Windows 10 x64. I know it says that the game was tested in Windows 8 so I would think it should run in 10 but I’m not having any luck. Open to any suggestions. If your running Windows 10 and have this game working please post back and let me know your setup. I cant seem to get this to run, no matter what the compatibility settings. I own the sold-out software version CD, and non of the patches recognise the game (not even the us V1.1 patch),I thought the euro patch would work (seen as if its says its a UK version and I live in the UK) but It doesn’t work. I’m using Window 10 64bit, any help on this would be appreciated. SNIP – Sorry, links cracks/hacks are not allowed here. I downloaded the v1.2 version, extracted it from the .rar file and replaced thething.exe that was already in my game folder. (I made sure the t’s in the “TheThing.exe” are lowercase and that the file is set the windows compatibility for XP service pack 2 I believe), the game runs amazingly, with mouse look as well. What search terms did you use to find that site? I can’t seem to track it down from the info you’ve provided. I got it working without problems. The only problem I have is a playability issue. It seems enemies in this game have green targeting boxes which change color to red when you shoot the aliens. At this point you should turn an enemy to barbecue. My problem is that these boxes are invisible to me. I don’t think it’s a settings issue. Let’s Play videos on the internet seem to have the green boxes. Still playably, but I never know when to bring on the flames. Interesting, I confess I didn’t play the game very far (my backlog is huge) can anyone else confirm this problem? Finally got this working! My PC is apparently very picky. I own the US Version and download the two patches v1.1 & v1.2 and applied them in that order. When I try and start the game I still get a black screen after the initial developers screen but if I hit ESC a couple times the menu for the game loads up and I can play. I also didn’t set any compatibility mode and the game still works on my setup. Game supports 4K res for those of you that can handle it, I set it to 3840×2160 on my 4K gaming monitor at 60Hz and it looks great. Did the first mission and the game ran fine. Thanks to those that tried to help me. Could never get this running in Windows 7 no matter what I tried. Just kept getting a black screen. Had to install it in a virtual XP in VMWare to get it running. No issues here in 7 or 10.